While I believe SharePoint 2007 makes a pretty effective collaboration tool for most organizations right out of the box, it does require some customization to mesh with the unique environment of specific organizations. There is a common misconception that such customization requires additional coding, which many organizations are loathe to do. Web Parts - Using the XLST web part, users can search and view data just by configuring the required parameters. Workflows - Visio content can be imported into SharePoint as workflows that manage the sequence of connected steps to complete tasks to ensure projects are going smoothly. InfoPath Form - This nifty feature enables Drag & Drop controls and Design Form so you can manage your SharePoint content much more easily. Reports - View and manage reports to keep track of across-the-organization information from a centralized location. BI & Dashboard Capabilities - Allows users to monitor business metrics, analyze the causes of issues, and enhance business intelligence to improve decision-making. CMS - Content can easily be added, edited, and searched. Users receive alerts when documents are changed and thousands of sites can be scaled at once. Theme & Branding - Increase your online presence by adding your power point theme to your website through SharePoint. User Management - Control which members can access and change what content through an easily configurable user management panel. These zero code solutions are excellent for SMBs because they do not require the skill of a developer to implement. Any layman can add and configure these features through SharePoint's simple interface and deployment is easy. The best part is that the foundation server is free and the resource costs are very low, so SharePoint customization is cost effective. 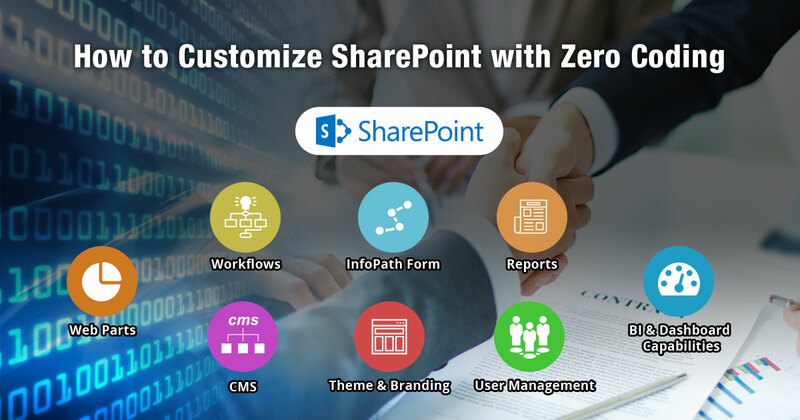 Call us at 484-892-5713 or Contact Us today to learn more about how to customize SharePoint with Zero Coding.